The Panic of 1837 was one such incident involving an unstable currency and financial system resulting in a lack of confidence in both government and the banks. An independent treasury system emerged when President Andrew Jackson transferred in 1833 government funds from the Bank of the United States to state banks. 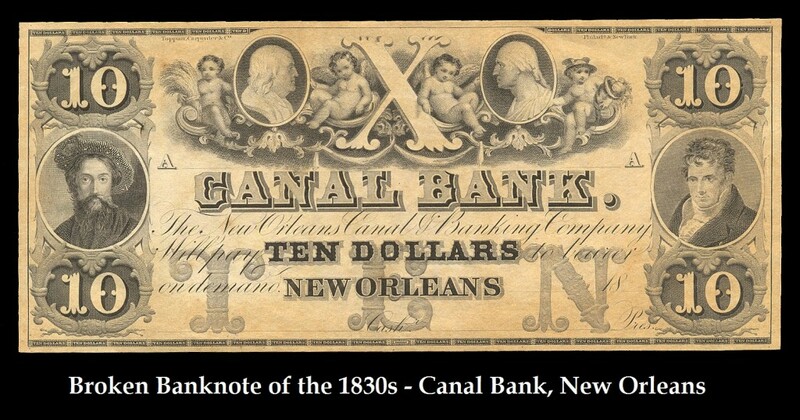 The Bank of the United States was a national bank created by the U.S. Congress. The first bank (1791-1811), proposed by Alexander Hamilton and the Federalists, aroused opposition, especially from the West, for its conservative policies, which meant it was against inflating the money supply through means of unbacked paper currency. Its charter was therefore allowed to expire. Difficulties in financing the War of 1812 caused the creation of a second Bank of the United States (1816-36). It prospered under the management of Nicholas Biddle and effectively served as a central bank. However, this again was viewed as a “TOOL” of eastern commercial interests by the Jacksonians. Andrew Jackson came to fame when in 1818 he led a reprisal against the Seminoles in Florida and captured Pensacola, involving the US in serious trouble with Spain and Britain. The conduct of “Old Hickory,” as he was called, pleased the people of the West and he was regarded as the greatest hero of his time. Jackson became associated with the increased popular participation in government, which later became known as “Jacksonian Democracy.” His liberal style movement almost won him the presidency in 1824, but the election ended in the House of Representatives, with a victory for John Q. Adams. This left a bitter taste in Jackson’s mouth and seriously injured his pride. 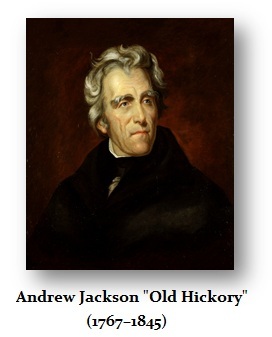 Still, Jackson ran again and won the US presidency in 1828. 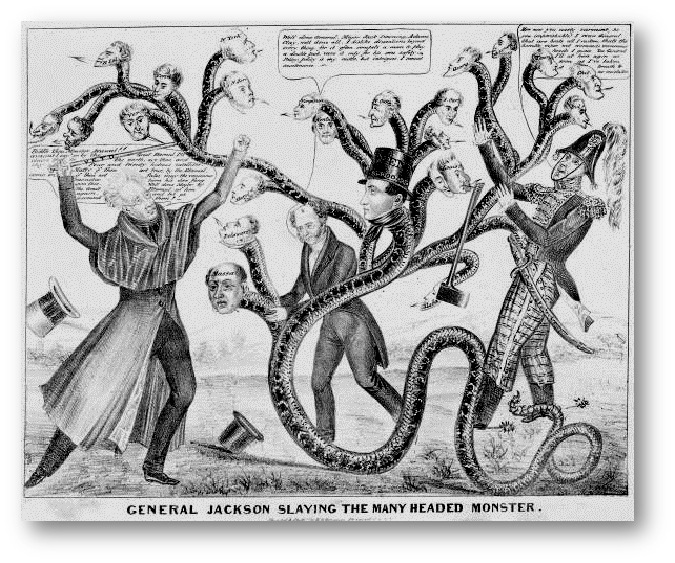 Jackson’s victory brought a strong element of “personalism” to Washington and his administration became known as his “Kitchen Cabinet.” Andrew Jackson was also the first President to create the “SPOILS SYSTEM,” which simply meant that all your buddies who helped in the election got fat paying jobs in government – the “spoils” of victory were given to your political supporters. From this anti-establishment and anti-Eastern States perspective, the fight against the Bank of the United States became an important issue in the presidential election of 1832, in which Jackson defeated Henry Clay. Following his victory, Jackson went about destroying the central banking system of the United States and transferred federal assets to chosen state banks, which became known as Jackson’s “pet” banks. This action seriously impaired the confidence in the currency and in 1836 Jackson issued the “Specie Circular,” which stated that all public lands must be paid for in specie. This in effect hastened the Panic of 1837 and tended to contradict the private script system where individual banks were allowed to issue their own paper currency. Thanks to the irresponsible actions of Andrew Jackson, the U.S. entered a serious economic depression following the failure of the New Orleans cotton brokerage firm, Herman Briggs & Co in March of 1837. 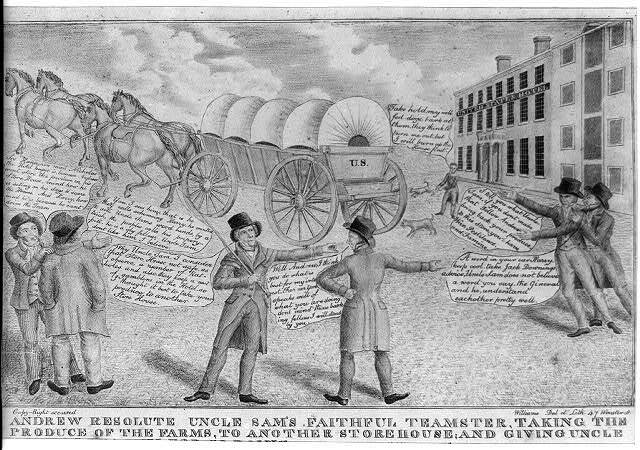 Inflated land values, speculation and wildcat banking contributed to the crisis, which became known as the “Hard Times of 1837-1843.” New York banks suspended payments in gold on May 10th and financial panic ensued. At least 800 US banks suspended payment in gold and 618 banks failed before the year was out. Gold disappeared from circulation and employers were forced to pay their help with what became commonly referred to as “shinplasters,” which were private bank currency of dubious value and far to often outright counterfeit. 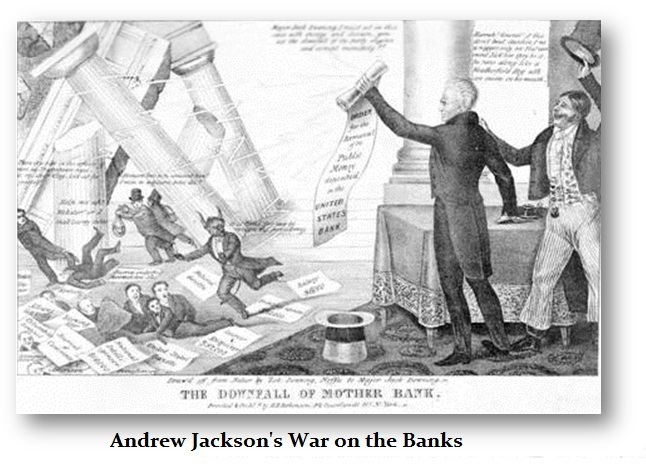 In destroying the central bank, Jackson had moved the Treasury deposits to state banks. They called this “Jackson’s Roulette”. This lent tremendous credibility to these state banks that all began to issue their own money. This became known as the Broken Bank Era to collectors. These “shinplasters” were effectively worthless and Jackson set off a massive depression. By the mid 1840s, states were going bankrupt for they had issued bonds trying to bail out the banks. Jackson proved one thing – the need for a central bank. Over 39,000 Americans went bankrupt, losing some $741 million as the depression reduced many to starvation. The depression spread to Britain and the rest of Europe. Congress authorized the issue of U.S. Treasury notes not to exceed $10 million on October 12th in a move to help ease the devastating economic financial crisis. By 1839 the depression had not improved very much. Within the next few years, the states of Pennsylvania and Maryland defaulted on their bond issues. In 1840, under President Martin Van Buren, an independent treasury isolated from all banks was set up. However, in 1841 the Whigs repealed the law, and it was not until 1846 that the Democrats restored the independent treasury system. The Act of 1846 ordered that public revenues be retained in the Treasury building or in subtreasury in various cities. The Treasury was to pay out its own funds and be completely independent o f the banking and financial system of the nation; all payments in and out were to be in exclusively specie. In practice, the system created problems in prosperous times by amassing surplus revenue and thus restraining legitimate expansion of trade; in depressed times, the treasury’s insistence on being paid in specie reduced the amount of specie available for private credit. The large expenditures of the Civil War also revealed problems, and Congress created the national banking system in 1863-1864. The independent Treasury was later used to stabilize the money market, but the Panic of 1907 proved the attempt futile. The Federal Reserve Act of 1913 marked the end of the system and the emergence of our current reserve bank establishment. During the Hard Times of 1837-1843, gold made two sharp rallies consisting of two individual 5.6 year cyclical movements. The collapse of the banking system was primarily caused by the fact that the U.S. government in general refrained from producing paper currency between 1793-1861. What had taken place was that the country was prospering, and it soon became apparent that there was insufficient money in actual circulation to meet th e demand of commerce. Due to the fact that there was a shortage of money and gold between 1793-1837, the States granted charters to hundreds of private banks within their jurisdiction. By the mere terms of these charters, a bank was authorized to print and circulate its own currency. The banking for this currency was the amount of money held on deposit in the bank. However, abuse became the norm and the tragic consequence was that many banks issued currency against deposits and gold reserves that did not exist. Even those banks that had operated above-board often failed when borrowers defaulted on their loans or when depositors withdrew their funds as other banks were failing. This left even the honest banks with no recourse but to close their doors as they literally went broke. This led to the term “wildcat,” which was applied to both the banks and their currency. Under such an unregulated banking system, it is not difficult to comprehend why gold virtually soared in purchasing power between 1800 and 1843.